PLEASE VISIT THESE LINKS FOR HELPFUL INFORMATION ABOUT PALM COAST CITY, OUR SCHOOLS AND MORE. Palm Coast is situated in the eastern portion of Flagler county, which is located on the Atlantic Ocean, in the heart of Northeast Florida, equidistant between the cities of Jacksonville and Orlando. As of October 2006 the City of Palm Coast has a population of about 70,000 residents and covers an area of approximately 50 square miles. Developed by ITT Corporation, in 1969, the original development plan encompasses 48,000 home sites on approximately 42,000 acres ( 65.62 square miles ) of the 68,000 acres owned by ITT. Paved street and central water and sewer serve all lots developed within the plan. An extensive water management system was designed to replenish the area's water table, which includes 46 miles of freshwater canals and 23 miles of saltwater canals. 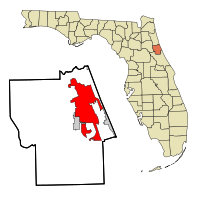 In 1975, the Flagler County Board of County Commissioners established Palm Coast Service District, which included almost 40,000 acres. Funds for the district were derived primarily from ad Valorem taxes and were utilized to provide fire services, fire hydrants, street lighting, animal control and emergency services. The City provides a wide range of services including development services, fire services, street construction and maintenance, parks and recreational activities. Palm Coast contracts with the Flagler County Sheriff Department for law enforcement services. The City currently has plans under way for a new City Hall, a town center, new fire stations, and additional lands for parks. Preservation and protection of environmentally sensitive lands is a key goal of this City as it prepares for the future. Please Call Us @ 1 386 517-6767 we would love to tell you more!! !